1. All abstracts must be submitted and presented in English. Please submit your abstract file using the Word template via below abstract submission site. Please use one Word file for each submission. 3. The first author is required to ensure that all co-authors are aware of the contents of the abstract before submission. 4. On the submission site, you are free to choose your presentation type from among the following four presentation types, but your choice is subject to change by the office organaizers for purposes of program arrangement. The copyright for your abstract shall be transferred to the PACRIM13 Office (the Ceramic Society of Japan). Otherwise, your abstract can not be accepted for presentation nor be included in the conference. 1. All legal rights other than copyright, such as patent rights. 2. Reuse in other works of all or portions of the abstract described above. 3. Reproduction of the abstract described above for the author's personal use and/or for company use, provided that these copies are not offered for sale. Step 1: Download the template. Step 2: Please prepare your abstract file according to the instructions written in the abstract template. Step 3: Please convert the abstract file created in Step 2 to a PDF file and check its contents. Please access the abstract submission site, follow the instructions on the site, upload the abstract file and enter any relevant related information. After confirming the contents sufficiently on the confirmation page, please press the submit button. Step 5: When your submission is successfully completed, you will receive a reply email from the PACRIM13 Office with your registration number. If you do not receive this email, the submission may not be completed, or your registered email address may be incorrect. If you do not receive the e-mail within half a day, please contact the PACRIM13 Office. During the abstract submission period, you can modify or withrraw your submitted abstract by accessing the abstract submission site again and logging in using your registration number and email address. Please be careful not to incorrectly withdraw your abstract during abstract modification. 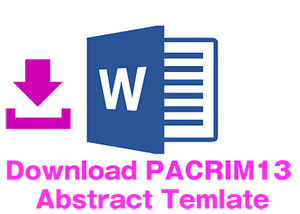 Please contact the PACRIM13 Office if you have withdrawn your abstract incorrectly at the time of modification. Abstracts will be reviewed by the symposium organizers, and a decision concernig acceptance will be announced to the authors by July 20, 2019. The PACRIM Executive Committee recommends that register by early-bird registration deadline (Sep. 20, 2019). Presentation guidelines will be announced prior to the meeting. PACRIM 13 does not plan to issue proceedings of the whole meeting. However, we are considering the following methods of publishing the contents of the lectures given at PACRIM 13. The PACRIM 13 Secretariat is asking each symposium organizer whether or not they wish us to publish the above Special Issue. If the symposium organizer apply to publish the above Special Issue, and the Editorial Board of the Journal of the Ceramic Society of Japan adopt this course of action, a call for papers for the Special Issue on the symposium will be issued. Submitted articles for this Special Issue will be published after a peer review as with a normal paper.